The wreck initially named “Unknown Dragger 012905” is now believed to be that of the Talisman, formerly known as US Navy sub chaser, SC-196. 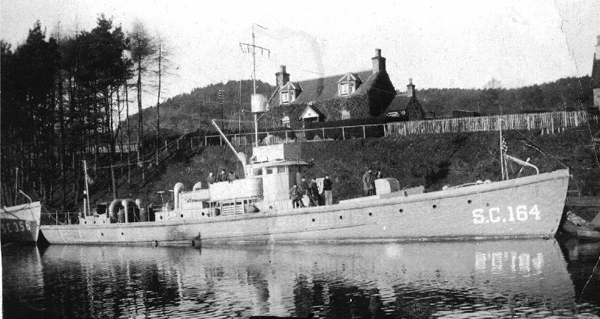 The “sub chaser” fleet came to be in 1916 during the First World War. At the time, the United States was still a neutral country; however, the sinking of 5 ships off the U.S. Coast by German u-boats prompted President Roosevelt to develop an effective anti-submarine vessel – and this vessel was the sub chaser. As is usually the case during wartime, raw materials were scarce, so sub chasers were built out of wood, and constructed in small yards. Sub chasers of the World War I era became known as the “splinter fleet”. These vessels were constructed to have both range and speed. As such, the ~110 foot long vessels were powered by three 6-cylinder, 220-horsepower gasoline-driven engines, which translated to speeds of about 17 knots and a range of 1000 miles. They had a narrow beam of about 14 feet (WWI subchasers). The “SC-1 class” sub chaser had a displacement of 85 tons, a complement of two officers, and 24 enlisted men. The armament consisted of two 3″/23-caliber guns and two machine guns. A total of 440 sub-chasers were constructed during WWI. Many were sold to allies or operated in Europe. Those that remained in the United States worked in concert with destroyers to seek out u-boats. The SC-196 did not appear to be a particularly notable sub chaser. The vessel was constructed at the General Shipbuilding & Aero Corp., Alexandria, Virginia, delivered on March 31, 1918, and commissioned April 15, 1918. The SC-196 was involved in three collisions during it’s time as a commissioned sub-chaser. The first occurred on June 20, 1918 in a collision with SC-194 in which both vessels were considerably damaged. Another occurred barely 6 months later in a collision with the tugboat Venture on December 13, 1918. In this collision, damage to SC-196 was minor and limited to the starboard forward quarter. Neither vessel was faulted in this case. Lastly, the SC-196 was involved in a collision with the gasoline freighter J.Q. Adams on March 31, 1919. Again the sub chaser was not at fault, and the Adams was cited as the responsible party. The SC-196 was damaged in the port bow, but was repaired. Collisions were not uncommon with vessels of this type, as they were difficult to maneuver. The SC-196 was ordered sold on March 21, 1921. On June 24, 1921 she was sold to Joseph G. Hitner of Philadephia. The value of the vessel was reported at $15,000. Hitner owned an iron works in Philadephia, PA. He was known for purchasing Navy ships and turning them into merchant vessels, or scrapping them. The SC-196 was later turned into the fishing vessel Mary A. Edwards and ultimately, the Talisman. A “Talisman” is an object that has magical power, or can be an object marked with magic signs, believed to confer on its bearer supernatural powers or protection. The Talisman, a recorded as a 74 ton vessel, sank due to unknown causes in 1965. The present state of the wreck suggests that it was a fishing vessel at the time of its sinking. We have yet to track down information regarding the fate of the Talisman, but she was reported lost 1.5 miles SSW of Gooseberry Island. Our research continues. The wreck sits upright with a slight list to port in about 160 feet of water. The hull has essentially “collapsed” on top of itself, but its shape is intact. The steel deckhouse structure remains, the weight of which likely precipitated the collapse of the underlying wooden portions. The shape of the stern is not quite elliptical, but tapers and rounds – difficult to discern since it splays out at the end. Heading forward, the wreckage breaks down into ribs along the bottom until rising up to a semi-intact section at the bow. The mast lies perpendicular to the wreck off the starboard side. In the mid-section of the wreck, there is a large winch, which appears to have sat directly in front of the wheelhouse. The wheelhouse no longer remains and remnants of its contents were identified off the side of the wreck. The beam of the wreck was measured using a survey tape. Due to the deterioration of the wreck it was difficult to find discernable edges to make an accurate measurement, but the beam was estimated at about 14 feet. Visibility tends to be average to poor at this site (a dark 10-15 feet), especially through the summer months. However, as is the case with most sites, in the winter visibility can be excellent. Not more than 10 feet of relief is found at this site and in low visibility it is sometimes necessary to run a line as the wreckage can be disorienting.